Tradeline Costs » Everything you need to know in one page! Tradelines costs is a topic of slight irony; when we first started this company, we thought costs were important. They’re not. Your goals are important. So, the question is not “how much do tradelines cost,” but what tradelines do you need (if any) to achieve your credit goals… then… how much do those tradelines cost. Tradeline costs should be relatively similar across the board (of legitimate companies). If the tradelines are ridiculously expensive, you’re likely dealing with someone trying to rake in cash and disappear. If the tradelines are curiously inexpensive, you’re likely dealing with someone who has no business expenses… meaning… someone who doesn’t have a business. 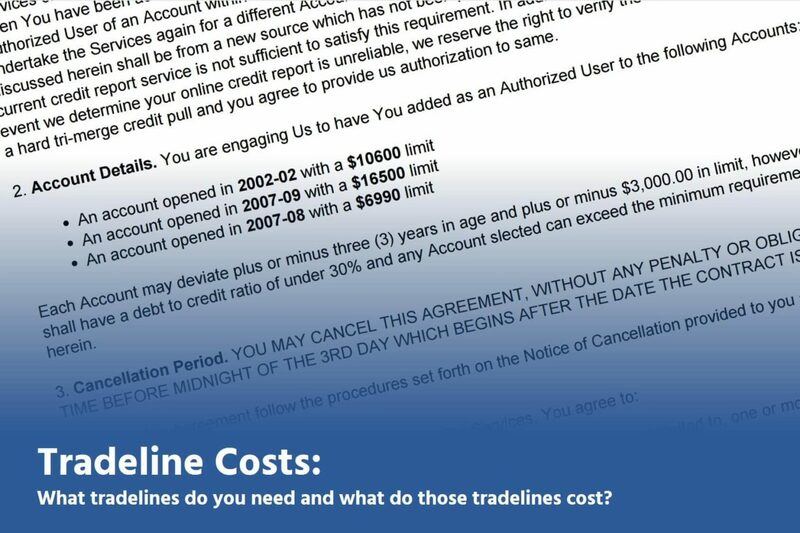 Here are our “tradeline costs” frequently asked questions to help you on your credit journey. What is the cost to add tradelines to your credit report? As discussed above, the cost of a tradeline depends upon the age and limit of the tradelines. So, the real question to ask (to find the cost for you) is what tradeline or tradelines do I need to achieve my credit goal. This questions can be answered by an analysis of your credit report, identifying the deficiencies of your credit report and selecting a tradeline to counter those deficiencies. While tradelines are priced almost in an arbitrary manner, there is a quantifiable value to them. You can do the calculations for yourself answering questions like, what is the score increase, how much will I save with the score increase, what is the score increase worth to me, etc. These questions have been answered by the free market and you can do a survey of prices across the internet and find legitimate tradelines companies similarly priced. Tradelines range in price based upon their limit and age, whereas the large and older the tradelines, the more expensive and likewise for the inverse. If you have looked for low cost or inexpensive tradelines, that is simply a synonym for a tradeline with a smaller in limit and younger in age. In that case, we have a lower cost tradelines for sale. Where can you buy tradelines with no upfront costs? To our knowledge, we were the only tradeline company in the entire country that offered tradelines with no upfront cost. Technically, we still do, but after many customers and companies finding it more difficult to pay for the tradelines than ordering, we had to make a change to our policies, in addition to filing many lawsuits against those who breach our contracts. Currently, we technically offer tradelines with no upfront costs, however, the money for the tradeline is retained in a trust account pursuant to 817.7005, Florida Statutes and is protected by our $10,000.00 surety bond. Again to our knowledge, we are the only tradeline company in the Country to offer this kind of protection. Can you purchase tradelines with tradelines (credit cards)? Maybe, but not with us. Our position is actually antagonistic to profit (because we lose sales because of it). We have a moral objection to allowing our clients to go into debt to buy our tradelines in order to go into debt (with the lines of credit they will obtain after our services). Basically, if you do not have the funds in your account, right now, to purchase the tradelines, then you do not have the funds to pay for loans or other credit you may obtain after you benefit from our services. Therefore, we only allow payments with real money in your bank account (not credit). How many trad lines will you receive for 792? How many tradelines do I get for the $792? Are they primaries? Scott, thanks for the question. As far as how much a tradeline you get for price, we do it the other way around. We do not do Price, Tradeline and Goal. We do Goal, Tradeline and Price. So, we’d have to talk to you first, review your reports and goal and then make a tradeline recommendation. Then you can talk to us about promotional, etc. We explain the difference between authorized user tradelines and primary tradelines and answer you question. 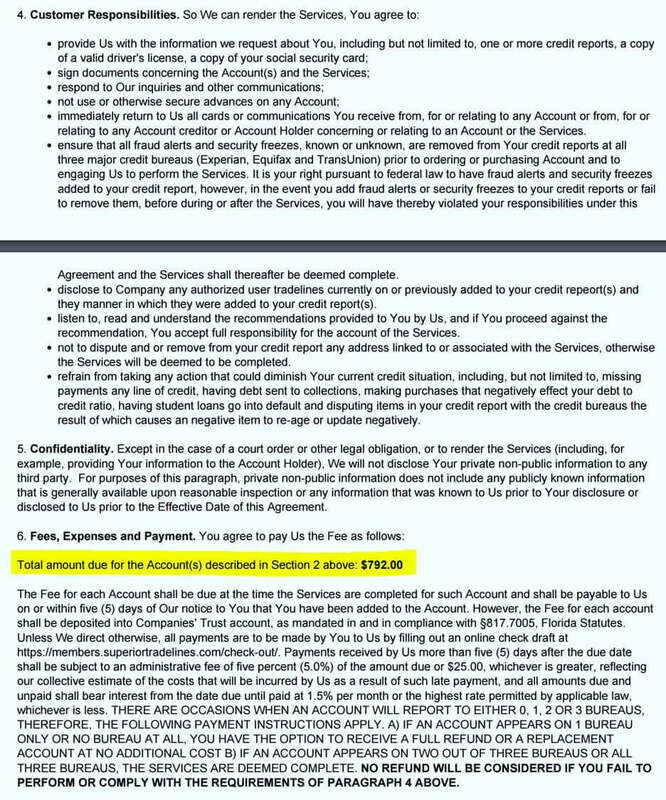 hi I read over the mock agreement and it seems to detailed as if you guys will be privy to all my personal information I am not allowed to have alerts or security features on my credit or the services will be deemed complete so this leaves me wondering why do you need all my personal info in such detail if I’m only purchasing tradelines? excuse me but this sounds very suspect….. I don’t understand specifically what you’re asking, but I’ll try to answer. We don’t need your information, the banks do. In order to have you added as an authorized user, the banks will require the name, date of birth and social of the to-be authorized user (that is, you). In addition, we request legitimate copies of this information because consumers (not us) try to pull shenanigans, for example, giving us fake social security numbers. When that happens, it puts us at risk, our card holders at risk and other clients (like you, potentially) at risk by being associated with fraud. So, we vet our clients so as to protect them. Excuse me to suggest that you have it backwards, because if a company is not doing those things, they are suspect. As far as the security freezes, I think you misunderstand the purpose. There is a questionable credit repair technique whereby consumers (not us) falsely claim “identify theft” in order to have accurate negative information removed from their credit report. In order to do this, they fill out a police report and then blast the credit bureaus with fraud alerts and security freezes. When you do this, it prevents authorized user tradelines from reporting. So, if they don’t report, what are you going to do? You’re going to blame us for a failure to deliver. So, instead of reacting and frustrating clients, we tell them, honestly, up-front, that they must remove security freezes and fraud alerts, otherwise we will either not work with them or they are voiding their refund policy. Again, if someone isn’t being up-front with you, they are suspect. Hey Sheila! What do you mean by 3day turn over? Hey Rell, that’s not really how it works. We could have 1000 tradelines and you may not get an 800 credit score. It’s much more complicated than that. You can call us at 800-431-4741 for a full discussion, but my quick advice here is this: Start with your goal, find out if tradelines will help achieve that goal and move from there. “800 credit score” isn’t really a goal, unless your lender said “You need an 800 credit score.” So, start with your end state (which isn’t necessarily a credit score) and figure out if tradelines will help you get there. I need to be at 680 as a minimum for the home loan I want. I need it there as of now, but literally just heard about buying tradelines. I’m not far from 680… 640, 663 and 665. My scores are every increasing. I’m utilized at 3%… Just need close quicker rather than later. Hey Elisha, you sound like a good candidate for tradelines. Please call us at 800-431-4741 or email us at info@superiortradelines.com (or just go to https://superiortradelines.com/start/ to get started) so that we can review your report and determine whether or not tradelines will help. Based on your scores (assuming they’re from a legitimate source), I’d say you’re in good shape. Help…….Had a Bk7 that’s 4 years old (kidney transplant) and 9 items that have reported late (2016) in the past. All have been current for the last several months though I’m needing to boost my scores (currently 600 across the board ) in the up coming months for mortgage processing. 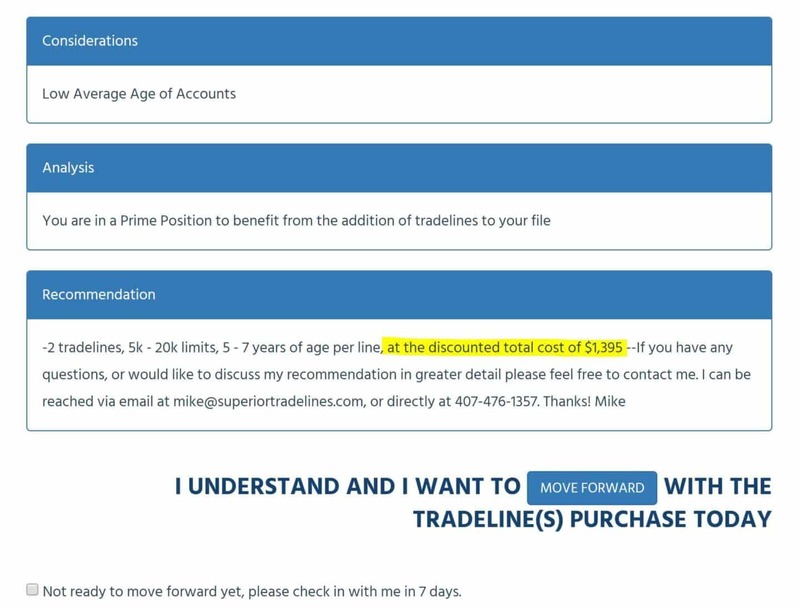 My oldest trade line on my credit is showing 16 years, how is this process completed moving forward? Thanks for the information. I won’t be able to give you advice worthwhile because I would need to know more about how those items are reporting. If you have accurate negative items, that’s one course of action. If you have inaccurate negative items, that’s a different course of action. So, the best thing you could do is go to https://superiortradelines.com/start/ and reach out to us. We will perform a free credit report analysis and you will know where you stand. Hello, although I am 30+ I am fairly new to credit with scores of 731 695 and 703. since I waited so long to start utilizing credit I am now faced with denials due to lack of credit history. out of the 3 credit cards I have one being secured I have no negative reporting and have a utilization of 15%. I am asking what tradeline price is needed not to increase my score but to establish a seasoned record of some sort. 4 inquiries max if i can recall and a few store cards that were recieved through preapproved offers. I owe close to $100k in student loans (good standings / never late), less than 20% of credit used and no charge-off’s. Would AU’s help my score even with student loans? Tiffany, those are all really good questions. They are easy to answer, too. However, almost all credit related question depend on what’s in your credit report. So, that’s why we recommend you call us and get a free credit report analysis. We can do it right there on the phone with you and answer any question you have (including time, guarantees, costs, etc.). I have 0 credit. I need a loan totaling 7500. How many tradelines would you recommend? The amount and how much history on the line(s) would help me accomplish my goal. Being that the score also is 0 what do you believe will it reflect the score in reference to your prior experience? Ty, just to clear up something so someone doesn’t take advantage of you: Tradelines DO NOT dictate how much of a loan you will receive, but may affect whether you receive the loan at all and on what terms. Scores shoot up dramatically if you have blank file and you add tradelines. However, the amount you get is determined by – among other things – your income or ability to pay. Are you currently seeking tradelines to sell? How do i become an affiliate? Sure. Please email kate@superiortradelines.com to discuss options. Thanks! Do u have tradelines for sell? Can you apply a Tradelines to my new business? Ghaea, you’re spot on. You absolutely do want to know – before you buy – what the reasonable expectations are for tradeline results. That’s why we do a credit repair analysis and tradelines recommendation (for free) prior to you buying tradelines. You can get started here: https://superiortradelines.com/start/ We look forward to speaking with you. Is there an trade line amount that would not go thru due to looking suspicious because of the high limit? Example: I have a total credit limit of 11,000, and i add a trade line with a limit of 25,000. How does this work or doses this work to increase my credit score? It’s a good question. It isn’t a matter of “looking suspicious.” Anyone in the Country has a right to add anyone they want as an authorized user on one or more of their credit cards. However, there are underwriting guidelines that can question whether the tradeline “is an accurate representation of” a borrowers credit worthiness. The example you raise, is a good one. I think 11,000 to 25,000 is okay. I think 11,000 to 50,000 might not be an accurate representation. Lenders will scrutinize someone with 4 collections, no primaries and everything else authorized user tradelines. They will say “Yeah, great score, but this isn’t you…”. In cases that make more sense, underwriters will actually accept the AU and the benefit the client enjoyed from it. What method of payment do you use for purchases and at what point do I pay? Hey Lennor! It looks like you’re already registered as an affiliate, with those questions answered. If not, let me know. Thanks!